Mindfulness apps are trending in a big way. Here are five we have recommended. Insight Timer is one of the most popular free meditation apps out there, and it’s easy to see why. 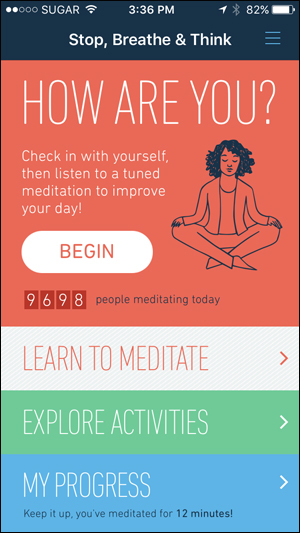 The app features more than 4,000 guided meditations from over 1,000 teachers—on topics like self-compassion, nature, and stress—plus talks and podcasts. If you prefer a quieter meditation, you can always set a timer and meditate to intermittent bells or calming ambient noise. 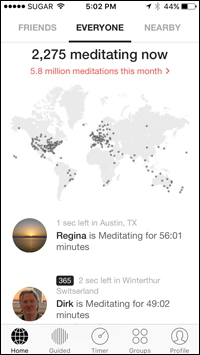 Right from the beginning, the app feels like a community; the home screen announces, “3,045 meditating right now / Home to 1,754,800 meditators.” After you finish a meditation, you’ll learn exactly how many people were meditating “with you” during that time; by setting your location, you can even see meditators nearby and what they’re listening to. Insight Timer doesn’t recommend step-by-step sequences of meditations to follow; it’s more like a buffet. 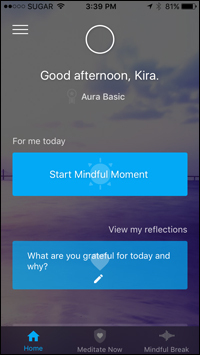 Aura is a meditation app with a simple premise: Every day, you get a new, personalized, three-minute meditation. The same meditation never repeats; according to cofounder Daniel Lee, Aura’s teachers are constantly recording new tracks. To personalize the experience, Aura initially asks about your age and how stressed, optimistic, and interested in mindfulness you are. The daily meditation that appears also depends on your mood: If you’re feeling great, Aura might suggest “Your Brilliant Heart;” select stressed, and you might get “You Have the Power.” If you like the day’s meditation, you can save it to your library for later listening. Aura claims to target stress, anxiety, and depression. If a short meditation isn’t enough, you can also listen to relaxing sounds or try their Mindful Breather feature, where you synchronize your breath to an animated circle that gently expands and contracts—surprisingly effective. The home screen encourages you to jot down something you’re grateful for, another tool for well-being. Aura is straightforward and sparse, but that’s part of the beauty. Particularly if you’re just getting started, or you don’t have lots of time to meditate, the simplicity of one meditation a day could be just what you need. According to cofounder Vishen Lakhiani, about 50,000 people around the world meditate to their popular “6 Phase Meditation” every morning, which is recommended for intermediate practitioners. (Beginners are encouraged to start with an eight-minute “Day 1” session.) The “6 Phase Meditation” guides you through different practices over the course of 20 minutes, including forgiveness, gratitude, and connection. 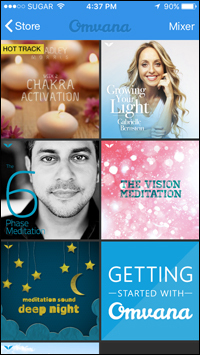 When you first download Omvana, your library includes about 10 meditations; to add more, it’s necessary to navigate over to the store, and then click on Top Tracks > Free or Categories > All free. Once you find a meditation you like, clicking the “Free” button will add the track to your library. Like Insight Timer, Omvana is more of a grab bag than a guided learning experience. And much of its library is off-limits to the free user. But if you’re looking for a solid morning meditation, or you’re overwhelmed by all the choice on Insight Timer, you might enjoy Omvana. If other meditation apps expect you to dive right in, Stop, Breathe & Think wants to help you get acquainted with mindfulness first. A section called Learn to Meditate explains what mindfulness is, why it’s beneficial, and what to expect when you press play on your first track. It even covers some of the neuroscience of mindfulness and the physiology of stress, in case you’re still skeptical. If other meditation apps expect you to dive right in, Stop, Breathe & Think wants to help you get acquainted with mindfulness first. Then, it’s time to get started. Stop, Breathe & Think features nearly 30 free sessions, many of which come in different lengths (and different voices—from placid Jamie to friendly Grecco). Most of them are short, up to 11 minutes, and you can choose to work around themes like Breathe, Connect with Your Body, or Be Kind. Or, simply set a meditation timer and find calm amid the silence or relaxing forest sounds. A progress page keeps track of how many days you’ve meditated in a row and your emotions, which you can record before and after each meditation. Plus, you can earn cute stickers: As a newbie, I’ve collected “Good Start” and “Tick Tock of Presence.” Stop, Breathe & Think is ideal for people who need some more structure and motivation to jumpstart their meditation habit. 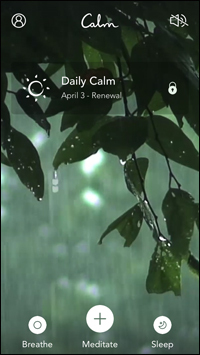 The relaxation continues with Calm’s free meditations, a smaller selection than several of the apps above—16 in total, some of which come in different lengths, from 3-30 minutes. You can start off with 7 Days of Calm, or try their sessions on Loving-Kindness, Forgiveness, or the Body Scan. Plus, like many other apps, you can set a timer for silent meditation or meditate to intermittent bells. For nighttime relaxation, Calm features four free “sleep stories”: bedtime stories for adults on everything from science fiction to scenic landscapes to help you transition into slumber.